It’s not very often these days that I get to taste a whisky exactly as old as I am. (We’ll skip the obvious jokes about being 21 or whatever, and that it will become increasingly rarer.) I suppose once you understand this fact, it’s very easy to become extremely bias to that whisky. You feel an affinity before you’ve even consumed it. It is a brother/sister whisky of sorts, if you’re a sentimental type (which I am at the moment, since I have my newborn son on my lap as I type). 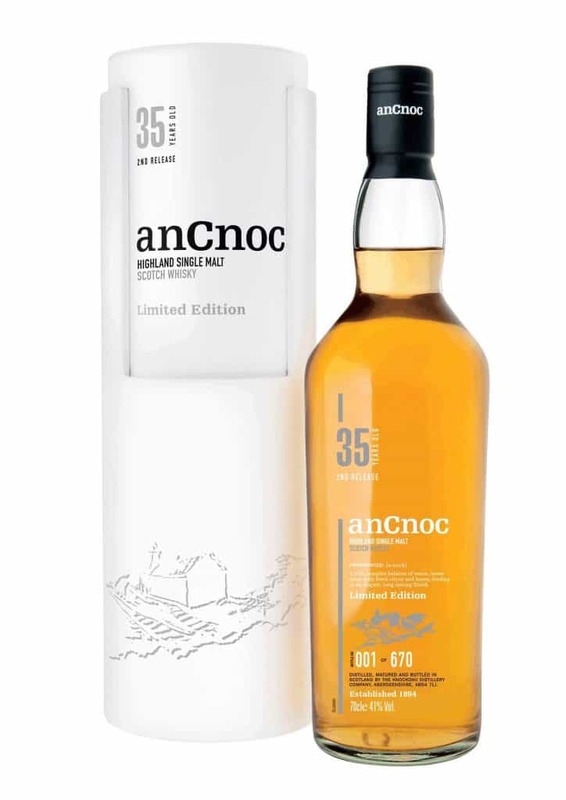 Which brings me to the anCnoc 35 Years Old – or rather, the anCnoc 35 Years Old Second Edition. 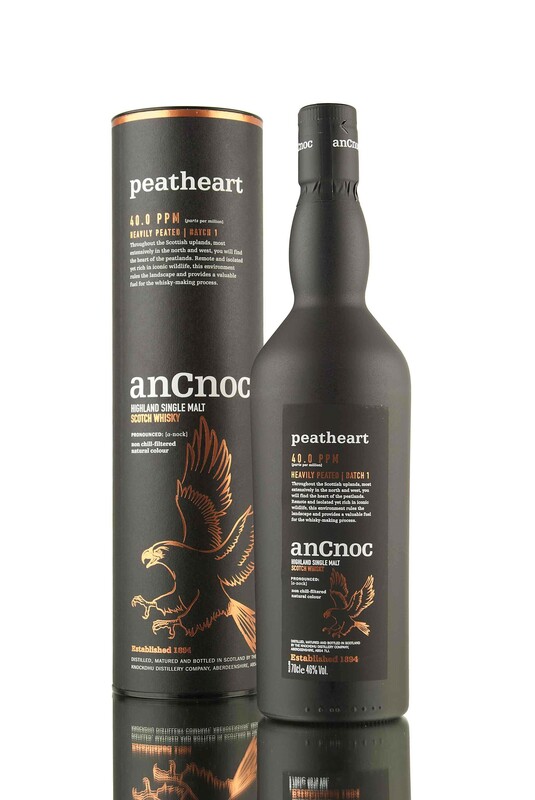 As the name would suggest, the second of these ancient whiskies from anCnoc – which is to say, Knockdhu Distillery. And it’s safe to say that Knockdhu Distillery is one of the more brilliant Scotch whisky makers, because the spirit is on the whole very good quality, and the whiskies are very reasonably priced. For the most part, they’re downright bargains and often very interesting. Not often you can say any of those things about some new whiskies these days. 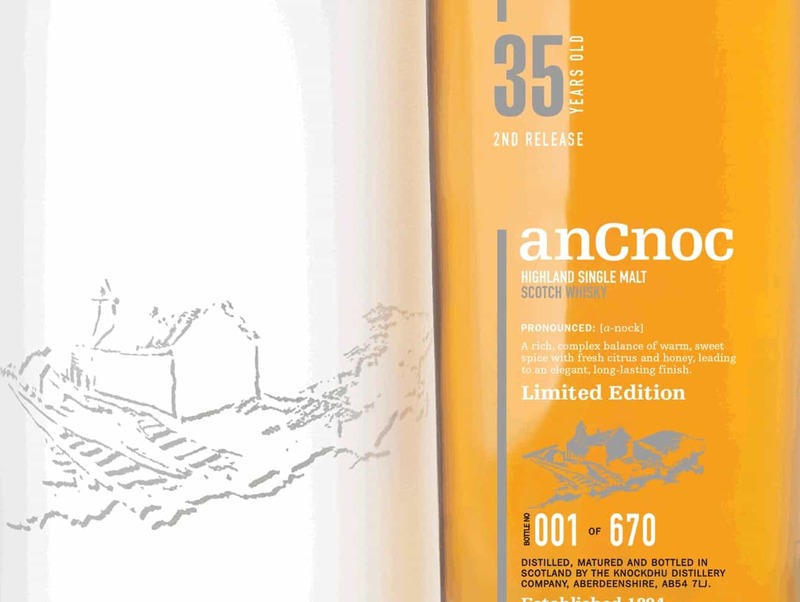 The anCnoc 35 Years Old second release is matured entirely in ex-American oak, having spent that time in a traditional Dunnage warehouse, which is what we like to see. 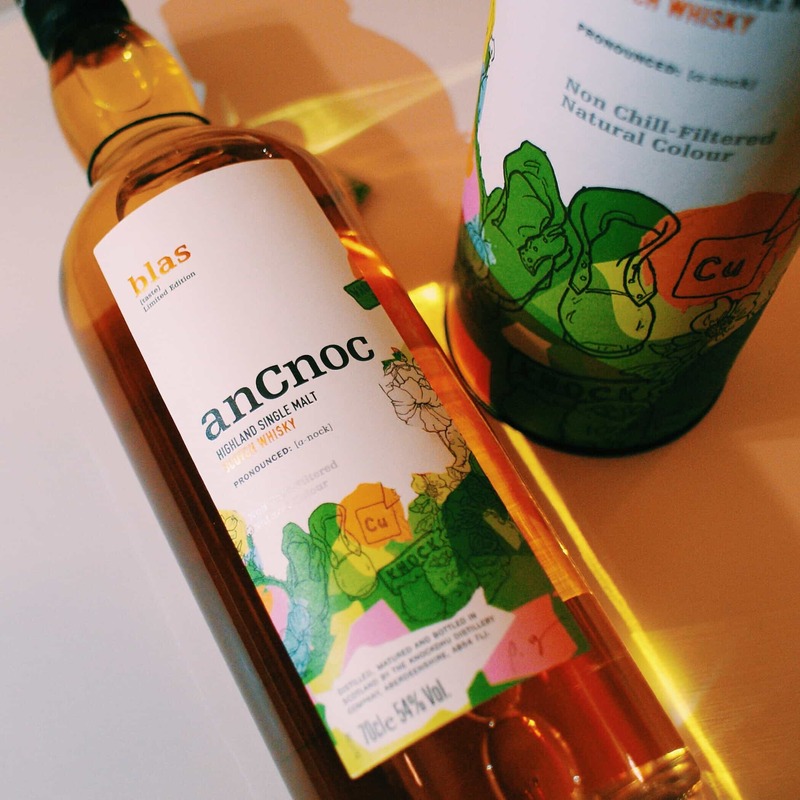 It’s bottled at 41% ABV and costs… £500. Quite steep for anCnoc (‘an’ anCnoc? Doesn’t quite sound or look right), but you’d see a great many other distilleries charging twice that at least for a 35 year old whisky. You have to remember we live in stupid times, and £500 for this is not unreasonable. On the nose: huge depth to this, but very much from the American oak end of things. A stack of honey, baked apples and pears, toffee and custard. Roses Lemon & Lime Marmalade. Mead. Gooseberries and just a gentle touch of peppermint (the lightest touch). Spring in the greenhouse: ripening tomatoes, maybe even honeysuckle. Apricots. Lemon curd (lots of this towards the end). In the mouth: one of the silkiest deliveries I’ve had in a long time. A heavy, dense spirit with age. The nose is echoed perfectly on the tongue, and the sheer intensity of the fruit is remarkable. It skirts between fresh fruits – apples and pears, limes, then fresh apricots very much. A little bit of honey and vanilla shows after those fruits fade, but it is just a fruit bomb. Orchard fruit. Remarkably not much woodiness at all for a whisky of this age, though towards the end of a very long finish comes flashes of nutmeg and pepper. A gentle Highlander with age becomes something altogether more impressive. Especially in pure bourbon casks. There’s a wonderful, classical styling about this, and a juicy, fruity intensity. Let’s face it, the anCnoc 35 Years Old is brilliant and full of subtleties. I think for the price it would have been nice to see this at a slightly higher strength, but that’s not to detract from something that is high quality stuff and an example of very good cask selection.